Every spring Japan organizes the Nakizumo Festival or the annual crying baby competition, with babies being given by their parents to sumo wrestlers who try to make the little ones cry as loud as they can. The contest is a 400-year-old tradition in Japan and is seen as a high point of spring, according to the international press. The tradition says that the louder a baby cries, the healthier the baby will grow and the more he or she will be blessed. It is also believed that a loud cry will scare the evil spirits away. During the contest, two sumo wrestlers face one another, holding the babies and trying to make them cry. The one who makes the baby cry first wins the contest and if the two babies start crying at the same time, the one who cries the loudest is the winner. If the little ones do not seem to be bothered by the sumo wrestlers’ efforts, there is also a priest there who shouts and waves at the babies as they are held in the air, so their cries are closer to heaven. The event is held every April in Tokyo’s Sonsoji Temple. This year, 80 babies were involved, all of them under a year old. A robotic fly with a body not much taller than a penny standing on edge has taken to the air, passing its tests with flying colors. 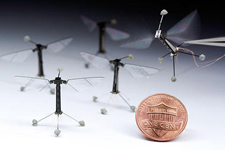 The RoboBee, as it’s called, is the smallest artificial insect yet flown, according to the team at Harvard that built it. It lifts off the table, hovers, and flies in different directions. At this point in its evolution, the bug is still tethered by thin wires that allow its designers to power and guide it. And landing remains an issue. The robot ends its sorties with all the grace of a mosquito nailed with a burst of Raid. Still, the tiny craft’s success – the team that designed it said it was the first such object to fly in a controlled manner – represents a key step in developing insect-size drones. Some members of the team suggest that future generations of the bug could serve as a robotic pollinator for plants, though without the side benefit of honey. Together with an announcement that another team of researchers has developed a buglike compound lens for collecting video taken with small aerial vehicles, the description of RoboBee appearing in a recent issue of the Journal of Science signals how far robotic bug research has come in the past decade. Demonstrating extraordinary skill and bravery, a helicopter pilot in Norway balances the aircraft on a crash barrier in order to drop a doctor at the scene of a remote car accident. The incredible feat came after a van left the road near the Storvasselva Hammar tunnel in Snillfjord on Tuesday, trapping the driver in the vehicle. Joining other emergency services on the scene, the footage shows how the air ambulance landed on the crash barrier, allowing a doctor on-board to safely leap out. Local media report that the van driver was able to stand after being eventually being freed, but the severity of his injuries is unclear. There was only one vehicle involved in the accident. Almost 80,000 people have applied to take part in a one-way mission to Mars, each of them completing a rigorous application that stresses the need for a “Can Do!” attitude, asks individuals about their sense of humor and requires the submission of an application fee that can be as much as $75. Mars One, the Dutch company behind the proposed mission, says it has received applications from more than 120 countries. It also says that the role of Mars explorer/guinea pig is “the most desired job in history”. More than 17,000 of the applicants are from the US – the most of any country so far. 1. Why would you like to go to Mars? 2. How would you describe your sense of humor? 3. What makes you the perfect candidate for this mission to Mars? After completing the grueling application, Mars hopefuls will have to sit tight for a while. Mars One is hoping that 500,000 will have applied by the end of August. That number will be whittled down to 50 to 100 for each of 300 geographic regions identified by the company. By 2015, that number will be reduced to between 28 and 40 overall. Those people will train for seven years; Mars One plans to run a reality TV show with an “audience vote” deciding who will ultimately get the nod. The $6 billion cost has to come from somewhere.